Residents of The Woodlands, 30 miles north of Houston, Texas were astonished this winter to see a bald eagle soaring over their community. People saw the majestic bird as they crossed the bridge over Lake Woodlands. It was quite a surprise to see a bald eagle sweeping through the sky over an area brimming with residences, commercial buildings, and shopping malls. Actually, a pair of bald eagles has nested for at least two consecutive winters in The Woodlands. That's not the only place where bald eagles nested this past winter in the Greater Houston area. A Texas Parks and Wildlife survey found 19 nesting bald eagles spread over the six counties that make up the Houston metropolitan area. Few birds attract attention like a bald eagle. An adult bird weighs 10 to 14 pounds, is three feet long from head to tail, and has a wing spread of seven to eight feet. A gigantically dark bodied bird with a snowy white head and tail, a bald eagle is easily recognizable…and always awe inspiring. Legend has it that on the morning of a great battle during the American Revolution, a group of bald eagles soared in the sky over the American freedom fighters. The loud shrieking call of the eagles made the fighting men believe the mighty birds were shouting, Freedom! Freedom! Freedom! When the Founding Fathers chose the bald eagle as the national emblem in 1782, there were about 75,000 nesting bald eagles in the area we now call the lower 48 states. But by the 1976 bicentennial of our nation, there were fewer than 800 nesting bald eagles. We almost lost the bird that symbolizes our freedom. Bald eagles inhabit forested areas near rivers, lakes and marshes. Although their main diet is fish, they also feed on the carcasses of large dead animals such as deer; waterfowl such as ducks and geese; and small animals such as rats and snakes. Bald eagle populations began declining in the 19th century as their habitat and sources of food became scarce. Until the late 1800s, bald eagles had tremendous sources of food from bison carcasses in the bison herds and the great abundance of waterfowl. However, nineteenth century shooters wiped out the massive bison herds and decimated waterfowl populations. Consequently, bald eagles lost a ready food source. Deforestation along waterways left limited space for eagles to nest and raise their young. Other factors contributed to the decline. For example, early ranchers and farmers shot bald eagles out of an erroneous fear the eagles would prey on their livestock. The widespread use of the DDT pesticide in the 20th century contaminated the fish and other animals that bald eagles consumed. DDT accumulated in the bodies of eagles, which in turn caused the thinning of egg shells and a failure of chicks to hatch. Fortunately, the Bald Eagle Protection Act of 1940 slowed the decline of bald eagles. The banning of DDT in 1973 helped to cleanse the toxin from the environment, providing the chance for reproductive success in eagles. In 1978, the U. S. Fish and Wildlife Service listed the bald eagle as an endangered species. Recovery efforts included a captive breeding program at the Patuxent Wildlife Research Center in Laurel, Maryland that enabled biologists to re-introduce bald eagles to states where they had disappeared. As a result of the recovery efforts, bald eagle nesting populations grew from about 800 in 1974 to nearly 6,000 in 1998. Nonetheless, the bald eagle remains on the endangered species list because most wildlife biologists believe the bird is still in jeopardy. The bald eagle's scientific name, Haliaeetus leucocephalus, literally means "sea eagle with a white head." The word, bald, in the English name derives from an archaic word meaning "shiny white." Our bald eagle, with its shiny white head, is the only species of sea eagle native to North America. There are three different wintering populations of bald eagles in the lower 48 states: the northern Great Lakes eagles, the mid-continent eagles, and the southern eagles. It's the southern bald eagles that nest in the Houston area, but northern non-breeding eagles do migrate there for the winter. 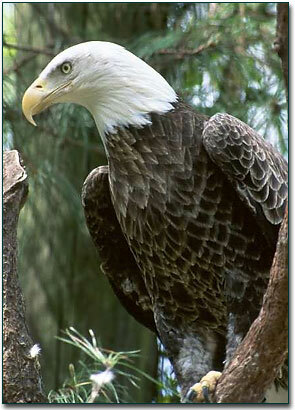 Southern bald eagles breed from Florida to East Texas in the winter months. During their summer non-breeding cycle, these eagles travel northward to the Mississippi River Valley and some go as far as Montana across to New York. Chris Gregory, a biologist with Texas Parks and Wildlife, monitors nesting bald eagles in East Texas. He has recorded about 70 current nest sites and explains that eagle populations in East Texas are climbing. Gregory says, "People are concerned about their eagles and are reporting nesting sites." Southern bald eagles build their nests in the tops of pine trees, usually near lakes or streams. They build a huge nest---as Gregory describes it, an eagle's nest is as big as an upside down Volkswagen beetle. Edith Erfling, a biologist with the U. S. Fish and Wildlife Service, tells the story of an eagle's nest in Brazoria County where the birds built a new nest right above the old nest. She calls it a "double-decker" nest. Erfling says, "To me, the nesting eagles are a good success story. They'd almost disappeared from the area. If the eagles are coming back, we're obviously doing something right with the environment." Recent evidence suggests that eagles are more tolerant of human activity near their nesting territories than biologist originally assumed. Good evidence of that premise is the nesting pair of bald eagles in The Woodlands. To ensure the continued increase in bald eagles, we must set aside forest reserves adjacent to bodies of water and commit to living peacefully with the bird. That's not too much to ask for a bird whose voice yells out the most precious of American values---Freedom! Freedom! Freedom!